A great Wisconsin hatch is the Hexagenia limbata hatch. Over the years I have found the Hex comparadun extended body dry fly pattern to float better and last longer during the Hex hatch. The way I tie this Hex dry fly pattern takes a little more effort but the fly will float better, which is especially important when fishing this hatch in the twilight hours. Changing flies in the pitch black of night can be a real hassle. 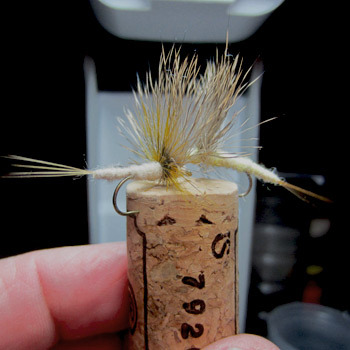 Note: Sometimes I like to add 3-4 wraps of good dry fly hackle right behind the deer hair wing. 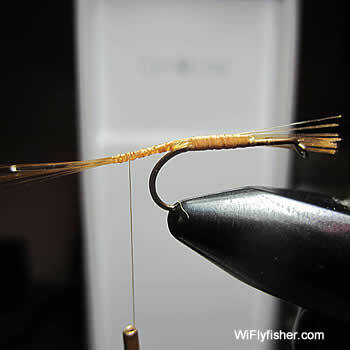 Clip the hackle underneath so the fly lays flush on the water. Below are step by step instructions for tying the Hex extended-body comparadun dry fly pattern that I have used for years. For extending the fly body I like to use 30 lb. monofilament or a small clump of stiff wild boar hair. Both are light weight. yet stiff enough to wrap the thread and dubbing around it without too much hassle. After wrapping the thread on the hook shank I use the thread to secure a fairly long piece of 30lb. mono to the hook. I like to use a longer strand of monofilament so I have something to grab. Eventually I will trim off the excess monofilament. Next I tie the tail fibers to the hook shank making sure the tail extends past the hook far enough. The monofilament will probably be as long as the tail, which is fine. We will trim it later. 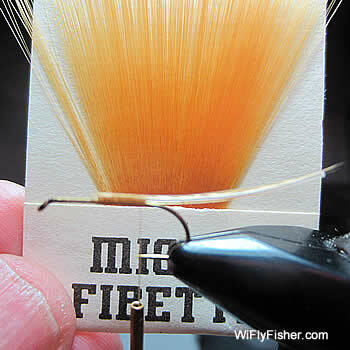 For my Hex pattern I like to use ginger colored Microfibetts because they are longer and more durable. Next, reverse the hook 180 degrees and stick the hook point into the vise jaws I find it is much easier and faster to tie the extended body on the monofilament with the hook reversed..
Now I wrap the thread around the monofilament and tail fibers as far back as I need too for making the extended body. This is where leaving some extra monofilament comes in handy. It gives you something to grab on too when needed. Plus, the extra helps make sure the thread doesn’t slide off the end of the monofilament. Now twist the dubbing onto the thread and wrap around the monofilament towards the bend of the hook. For my Hex dun pattern I like to use tannish colored dubbing, or tannish-yellow dubbing. (It technically doesn’t matter what color you use for the dun because it will be pitch black out when you are fishing the Hex hatch and the fly’s silhouette and your presentation are far more important than color in the dark.) 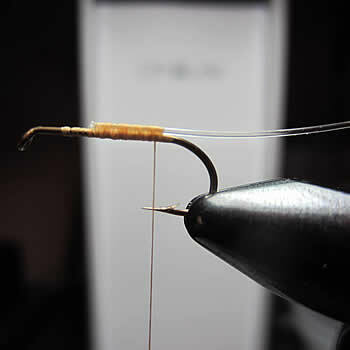 Once I have finished wrapping the dubbing on the monofilament up to the hook bend I reverse the hook again in the vise. At this point I usually trim off the excess monofilament that extends beyond the body. Then I move my thread forward and create the comparadun wing using deer hair that is approximately the length of the entire body. Now pull the wing back and take another smaller clump of hair and tie the clump of hair down in front of the wing facing the tips towards the hook bend. This helps keep the wing from falling forward or backwards. 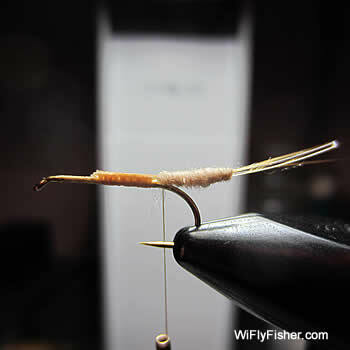 After the hair wing is secured wrap the thread back towards the hook bend and add more dubbing to finish the body. 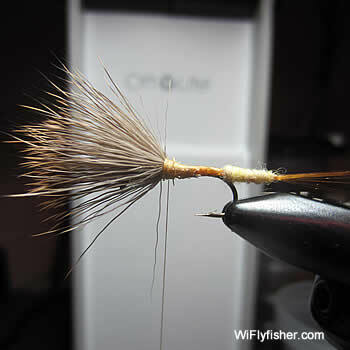 Recently I have started to add one dry fly hackle immediately behind the deer hair wing. I first saw this done last summer by Bob Jacklin out in West Yellowstone. He uses this technique for his Green Drake comparadun dry fly pattern. 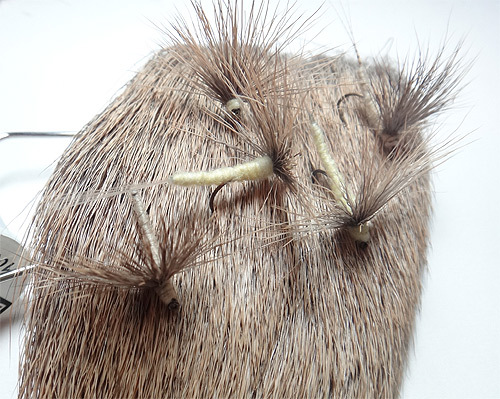 Although you can skp adding the hackle I do feel the hackle gives the fly’s deer hair wing a better overall visual appearance and it adds some extra floatability and durability to the fly, which can be really important when fishing these large flies in the dark. 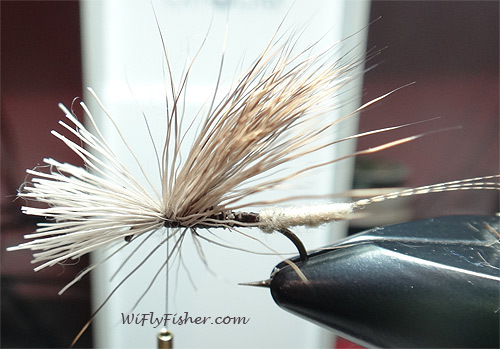 After adding a few wraps of the hackle I secure the feather and trim. Then I wrap the thread in front of the deer hair, add some dubbing and build it up to help keep the deer hair slanted straight up or slightly backwards towards the hook. Last, whip finish. 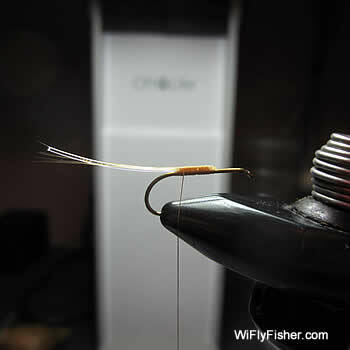 The extended body dry fly pattern works great when the Hex duns are on the water. Just be sure to hold onto your rod real tight when you hear that big gulping noise out in front of you in the dark shadowed waters.